The iPad version of the books contains the same 170,000 words as the print book, but also includes 600+ illustrations. It also has 10 short videos, sound files and interactive elements. ISBN: 978-0-9930057-1-8. "[The] iPad edition puts [publishing] professionals to shame, featuring lovely use of video, a wealth of images, clever 3D models, and even a 19th-century ditty about speeding cyclists.” The Guardian, 23rd December 2014. 170,000 words. 346 pages. 21-page index. 90,000-word notes and references section (online-only). 16-page colour plate section. 4 years of research and writing. The hardback was a one-off special and sold out within six hours of going on pre-order. The softback SOLD OUT within two weeks. Second-edition hardbacks and softbacks are now available from Island Press. Reviewers have been positive in their praise for the first edition of the book. The revised second edition was published in April 2015 by Island Press of Washington, D.C. It is available in a number of formats: print, Kindle, ePub and a media-rich iPad version. "...when all's said and done, I don't really care why you buy a copy of this book, whether it's on paper or in pixels, but buy it you must ... [it is] a major triumph ... for each and every cyclist the world over." "Roads Were Not Built For Cars is a polemic shot through with a sense of injustice for the written out and colonised – the literally marginalised literally pushed in the gutter when they had literally paved the way for the motorist – [yet] it could be enjoyed by Jeremy Clarkson." "This volume is the cycle history dissertation for our age … [with] fascinating snippets not noted elsewhere … Whenever a new character or event [is introduced] it is seamlessly related to other players in the story and what may start as a diversion turns out to add flavour, knowledge and enlightenment ... Readers interested in the history of the motorcar will be similarly hooked ... None of the old cycling myths are regurgitated; the prose and proof-reading are beyond reproach and Nicola King’s indexing is immaculate … I cannot recommend this book more highly." 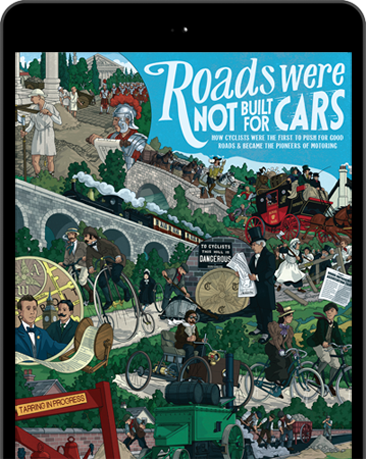 “Roads Were Not Built For Cars is something of a bicycling Ben Bur … [and also an] entertaining exploration of the early days of motoring …” David Henshaw. A to B Magazine, December 2014. "I don’t believe that there has ever been a more thorough explanation of firstly why roads are now seen as being purely for transport use; secondly why the needs of motor transport have priority over any other consideration; and thirdly the role that bicycles have played ... This book ... gives hope that things can change ... Looking to the future, the book questions whether motorways ... could eventually suffer the same fall from grace as railways if they become less relevant: it might seem inconceivable now, but this book reminds us that transport priorities can and do change, along with the building works required to support them." Cyclists were the pioneers of motoring. Macadam. Tarmac. Setts. Asphalt. Solid surfaces are more important than you may think. How the League of American Wheelmen pushed for better roads. The RIA was created in 1886 – before motoring was legal in the UK – by the Cyclists' Touring Club and the National Cyclists' Union. People do. Not people just in cars. This is a flick-through of the “running pages” for the print book. The iPad version of the book – available from iTunes – has 170,000 words, 10 short videos, 2 sound files, a 3D spinnable object and 580 illustrations, most of which zoom to full screen. It costs £14.99 and, in October 2014, was the best-selling history book in UK iTunes. Roads Were Not Built For Cars has 170,000 words spread liberally over fifteen finely-argued chapters. There’s also a stonking great appendix detailing the 65 car marques that had bicycling beginnings, a 21-page index (print book only) and a roads history timeline. The notes and references – all 90,000 words of them – are online. PEDAL POWER: In the 1890s, American cyclists were a force to be reckoned with. They voted for candidates in favour of Good Roads, and could decide local and national elections. Behind the scenes, officials from the League of American Wheelmen were cogs in the Federal government machine. FROM KING OF THE ROAD TO CYCLE CHIC: Cyclists of the 1880s and 1890s were transport progressives. Many later morphed into motorists. When bicycles became affordable to the masses the social cachet of cyclists became but a memory. By the 1920s cycling was “poor man’s transport” and in the 1960s it was thought that everybody would soon own a car, and that bicycles would become extinct. WITHOUT BICYCLES MOTORING MIGHT NOT EXIST: The first automobiles contained more cycle DNA than horse-drawn carriage DNA. In the 1890s there was a seamless transfer of technology, personnel, and finance between bicycle and motor car companies. Pioneer racing drivers, motoring journalists and automobile event organisers tended to have cut their teeth in the world of cycling. MOTORING’S BICYCLING BEGINNINGS: The motorists and cyclists of the 1890s and early 1900s were not from different sections of society – they were frequently the exact same people. Motoring pioneers originally celebrated their cycling credentials. By the end of the 1920s, with the development of its proletarian image, cycling’s vital contribution to the development of motoring was deliberately suppressed. AMERICA’S FORGOTTEN TRANSPORT NETWORK: For a few brief years, the intense interest in cycling from American progressives led to the creation of the world’s best facilities for what was felt to be the urban transport mode of the future. GOOD ROADS FOR AMERICA: The push to pave America was started in the 1880s by cyclists who wanted smooth roads. The “Goods Roads” movement snowballed before the introduction of motor cars. “THE MECCA OF ALL GOOD CYCLISTS”: For the final 30 years of the 19th century, Ripley in Surrey was the go-to destination for the smart set of the day. The 10 miles between the Angel Inn at Thames Ditton and the Anchor Hotel at Ripley were world-famous, and busy with cyclists on all manner of machines. Many of those who would go on to become influential motor magnates cycled along the “Ripley Road” and, years later, would gather for nostalgic reunions. 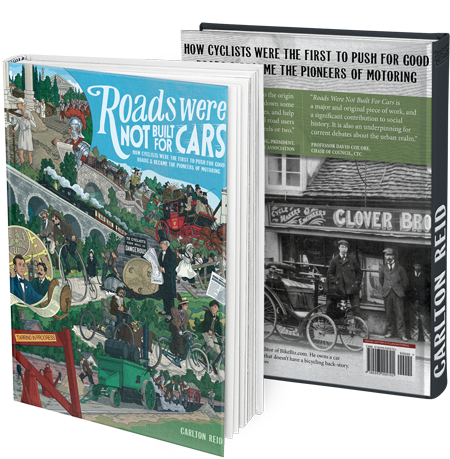 “WHAT THE BICYCLIST DID FOR ROADS”: In 1886, ten years before the arrival of motor cars, a group of well-heeled individuals created an influential organisation that lobbied for better road surfaces, and pushed for the nationalisation of Britain’s neglected highways. The trailblazing Roads Improvement Association eventually became the cornerstone of the “motor lobby” but it was founded, funded and originally run by cyclists. HARDTOP HISTORY: Asphalt is a bitumen-and-aggregate carpeting that’s so ubiquitous it’s invisible. Blacktop has a long history but there was no inevitability about its mainstream adoption. It took many years of trial and error before the modern recipe was settled upon. In the meantime, many roads were capped with granite setts, dusty macadam and forgiving rubber. London’s roads, like that of many other cities, were surfaced with Australian hardwoods. WIDTH: Many roads have been wide for hundreds of years. They were widened not for motor cars but to reduce congestion, to create better vistas, to prevent insurrection or to create healthier, wealthier streets. Here are scrollable intros from two of the chapters, as they appear on the Kindle app on the iPad. Roads belong to all and need to be shared by all. However, there’s a long history of some road users believing they have priority over others. Belief in road “ownership” – even if it’s just the few metres in front and behind the road user – leads to disagreements, but probably what many motorists and cyclists would agree on is that roads are thoroughfares for travel. Pioneer motorists would amplify and expand the idea of roads being for transport only but the transformation of the road’s role was already well advanced by the time the first automobiles came along. The bicycle, the fastest vehicle on the road in the 1870s through to the mid-1890s, certainly played a part in redefining what a road was for, but apart from a smooth surface, the slim, single-track bicycle needed little in the way of built infrastructure. Trams, on the other hand, needed a great deal of dedicated space. With their rails and, once electrified, their overhead cables, trams very much transformed the concept of what roads were for, and that large parts of them could be appropriated for travel, and travel alone. Later, motorists benefited from the land grab made by private tram companies. This was done by ripping out the rails put down at such great expense, and replacing them with motor-centric asphalt. The hegemony of the motor car was accelerated by countries co-operating to ease its passage. In Europe, in the early 1900s, it was extremely difficult to drive between nation states. Motor cars had to be “imported” at every border and pay punitive duties in each country visited. Many countries required motorists to pass national driving tests. Automobile clubs – many of them founded as cycling clubs – lobbied hard to get such restrictions lifted. The legacy of the PIARC decision in 1913 is still with us …. The invention which had the most immediate influence on the early history of the automobile was the bicycle. The first automobiles contained more cycle DNA than horse-drawn carriage DNA. In the late 1890s and early 1900s there was a seamless transfer of technology, personnel, and finance between bicycle and motor car companies. Pioneer racing drivers, motoring journalists and automobile event organisers tended to have cut their teeth in the world of cycling. Officials in the early motoring bodies often kept on working for cycling organisations. No preceding technological innovation – not even the internal combustion engine – was as important to the development of the automobile as the bicycle. Engage reverse gear. Not even the internal combustion engine! Quite some claim. Flink didn’t back up his claim with pages of evidence. I shall now do so. The first edition books – 1100 of 'em – are sold out. The book is available in a variety of digital formats. The 2nd edition is available for pre-order from Island Press. Carlton Reid has been a journalist for 28 years. His work has appeared in National Geographic Traveller and The Guardian and many other magazines and newspapers. He is the executive editor of BikeBiz.com, a monthly trade magazine which he founded (and sold to Intent Media in 2006). He is also comms for the Bicycle Association and the BA’s Bike Hub levy fund. In 1997 he was the co-owner and editor/publisher of On Your Bike magazine, a magazine for family and “born-again” cyclists, which was sold to EMAP of Peterborough in December 1999. (EMAP turned the general interest, non-Lycra magazine into a mountain bike magazine – it soon folded, and not in a good way.) His previous books include Adventure Mountain Biking (Crowood Press, 1990); Complete Book of Cycling (contributor, Hamlyn 1997); I-Spy Bicycles (Michelin 1998); Discover Israel (Berlitz 1998); Lebanon: A Travel Guide (Kindlife 1995); Classic Mountain Bike Routes of the World (contributor, Quarto Publishing, 2000) and Bike to Work Book (November 2008). He was co-manager of the first ever British mountain bike team. This team competed in the World Championships in Villard de Lans, France, in 1987. In June 2008, he was inducted into the MBUK Mountain Bike Hall of Fame, one of the first 20 inductees. He got into mountain biking after a mid-1980s failed attempt to cycle around the world on a Claud Butler Majestic touring bike (he got as far as Israel and then decided to cycle tour the deserts of the Middle East for a year on one of them new-fangled mountain bikes). 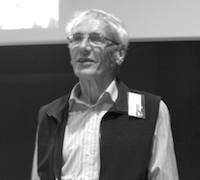 SPEAKING ENGAGEMENTS – Carlton Reid on tour.